I am beginning to realize that my views of the current generation of young adults (late teens, early 20-somethings) is hopelessly (if heartwarmingly) skewed. Nearly everyone I know in this age group is an aspiring musician. Some are at the top of the heap of their high school jazz bands, some are studying at schools of music, and some are ready to launch their post-college careers. But those I have gotten to know all share at least one thing in common—gratitude. Not only are they thankful for the blessing of their innate talents, but they are quick to acknowledge the first teacher, the mentor, the band director, the club owner who provided countless lessons and opportunities. And they are grateful for the support—emotional and often financial—that they have received from their families. Those of us who enjoy the results of this support need to take time out and express our gratitude as well. 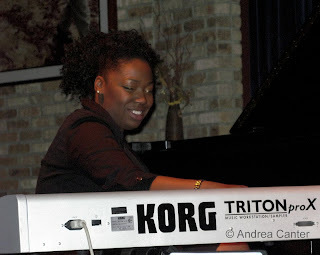 I first encounted Paris Strother when she was a senior at DeLaSalle High School and working at the Dakota Jazz Club. She was the first performer at the newly relocated Dakota in October 2003—owner Lowell Pickett asked her to open for Bobby Watson at the private opening party. There she was, this youthful teen, playing music that should have been pouring from the fingers of a much older musician. She had thick chords and powerful command of the keyboard even then, more resembling McCoy Tyner than her hero, Bill Evans, yet that lyrical thread of Evans was nevertheless detectable. I’ve been a Paris fan ever since. We catch up once or twice a year since she left home for studies at the Berklee College of Music in Boston. Last week Paris graduated, and now looks forward to a future of performing, composing (particularly scoring films) and maybe some teaching. And she held her graduation party, of sorts, appropriately on the Dakota stage with her working quintet, aka Paris Strother and Gentlemen. The Gentlemen came out from Boston for what turned into two nights at the Dakota and a night at La Bodega. Paris had “warned” me that this music would be loud, full of energy and plugged in! It was all of the above and more. With her sleight of hand percussionist Jonathan Merla on Sunday night, along with guest trumpeter John Raymond (another locally grown, rapidly evolving talent in his senior year at University of Wisconsin Eau Claire) and a special one-tune appearance by ace drummer Kevin Washington, Paris covered a wide swath of Latin and Afro-Caribbean rhythms, original compositions and arrangements of Carlos Santana. The energy was electric as was much of the guitar and bass, while Paris often had one hand on the Steinway and the other on the Korg keyboard. The joy and energy may have disguised the complexity of the music, the subtle insertions (e.g. licks of “My Favorite Things”), the wickedness of that right hand and the power of the left. 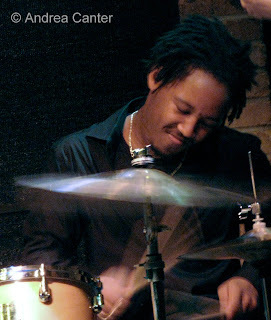 Drummer Louis Cato deserves special mention, his high sticks and never-ending fluid motion reminding me of Winard Harper. The second set went on nearly two hours—youth has its advantages! The second night at the Dakota had a different flavor, in part due to the absence of conguero Merla (who left for a tour with Erykah Badu), in part, Paris said, because the Dakota management wanted a lighter performance adjacent to the dining room. I missed the all-acoustic first set, arriving in time to hear the band cut loose once again, this time in a more blues and funk vein. The band started off with more Carlos Santana, but pretty soon the ensemble spewed forth “Afro Blue,” “How Deep Is Your Love,” and, I swear, a lick from every big hit of the 70s. Some of the funkiest blues to hit the Dakota followed (and I say this one night after Javon Jackson and Les McCann blazed through two sets on the same stage), with guitarist Rene DelFierro conjuring a wild B-3; next a tune from Brian Wilson and the capstone of the second set, Paris’ own “Sky Blue.” Don’t confuse this with Maria Schneider’s recent tune of the same title. Yet there are similarities –both composers build orchestrally from firm roots in bop and blues, but Paris creates her symphonic works for just piano quintet; the music builds in bold sweeping strokes with the drama of a film score, which perhaps is what Paris had in mind all along. This music does not beg for a film backdrop―rather, a film should be begging for this score. The short final set was largely acoustic, Paris with just the trio of Josh Haari (on acoustic bass) and Louis Cato on drums. They bounced through “Poinciana,” washed Hancock’s “Dolphin Dance” in hazy blue, and brought back guitarist DelFierro for one more funk blast before Paris sent the guys offstage for her solo finale, a multiphonic thunderstorm she later attributed to Denny Zeitlin. So much power, passion and artistry in just two hands that have barely experienced two decades leave one breathless. A few months ago, as she approached her graduation from Berklee, Paris was eloquent in her assessment of the opportunities she’s had over the past four years—the area club gigs, the master classes with the very top echelon of jazz artists, the assigned projects that have pushed her talents into new spaces, the travels with fellow students to perform to the welcoming ears of music fans in Russia, the semester in Greece where she found new outlets for music, new friends, and new sources of support and adventure. To Helen and Curtis Strother—know that the money was well spent. And much appreciated.